Ok, typically, I am not the "make it yourself" kinda gal at all. But, I had been fond of using these little Cascade pillow-type dishwasher detergent tablets and frankly, they can get pricey quick (23 loads for $6). So, when I saw this vinyl project on Being Creative (to keep my sanity) that combined crafting with making dishwasher detergent, I wanted to give it a try. I followed the recipe on Being Creative (to keep my sanity) but used just a third of the recipe since it makes so much and can harden over time if not air-tight. I bought the same kind of container she did at Walmart but I think mine is smaller. I couldn't wait to try it out and was so pleased with my results! Just as good as the pillow-tablets I had been using and at a fraction of the cost. A word on the text - I used the Cricut Don Juan cartridge and cut the base letters at 1-1/4" using blue Cricut vinyl. It was a teeny bit too big (eyeballed the length - whoops!) but I thought it was close enough. Now, there's no excuse that my kids can't tell how to use this - LOL! This is a scrap-lifted project I just had to pass along - send her some comments if you give this a try! thanks for the recipe link. This would be good to make a combined craft with a CLEAN and DIRTY door label! Looks like way too much work to me. I give you credit for trying it. What a great idea! Now, if I only knew how to keep my letters spaced evenly... Thanks for sharing! Very frugal! I love it! I think I am going to make my letters a little smaller so I can add a design. . . Maybe a flower . . .
Have thought about trying to make my own detergent, but never gave it a shot. Clever project so now I just might. Thanks! since they took phosphates out of the commercial dishwasher soap recipes I have tried about 10 different store bought brands/formulas with no luck - my dishes all have a film from our very hard Houston water. Rinse aids don't even help much at all. I'm going to have to try this recipe to see if it will actually keep the film off the dishes. cute storage idea. i've been making my own dishwasher soap for years. simple 2 ingredients. 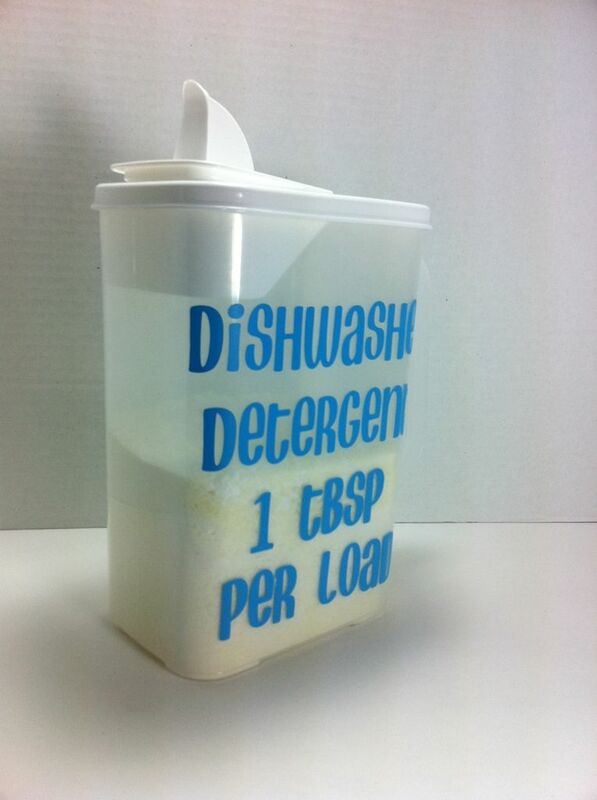 I have been making my own laundry soap for a few years now! Thanks for this recipe and great storage idea! Thanks for sharing. Great idea! I checked out the Being Creative Blog. I couldn't leave a message because I have had problems with Blogger on some accounts. You are a better woman than I!! Great idea but I think I'm just not interested enough! Thanks for sharing! Tempting. Store bought soaps just aren't cleaning as well. Hmmmmm. I've just always preferred liquid over powder. Thank you for the link, I know how expensive it is specially when you are a big family like ours(7). I love this idea!!! I'm definitely doing this in my house over the weekend!! Great idea! Please check our our new scrapbooking blog, we appreciate all the support! Thanks! I had been told to mix Borax and washing soda for dishwasher detergent which does an acceptable job - I bet the Epson salt & lemonade will make it much better!! Plus it will smell wonderful! Joy, you are always so sweet in sharing such great ideas with us. We could all use money saving tips in this crazy economy. But I know me and know I would opt for the easier method of just buying the ready made store bought stuff in the long run. I was getting very disinchanted with the spots and film from the store bought detergents also. I was having to whipe all of my dishes with a cloth as I was unloading them until I found the Quantum Finish Powerballs. Luv them. They are mess free little packets that you just lay in your dispenser. Your dishes (especially glassware), comes out sparkeling and film free. So if anyone out there who was having problems and not into time and mess of mixing your own, try them I know you will be pleased. We have really hard water here in San Diego as well. 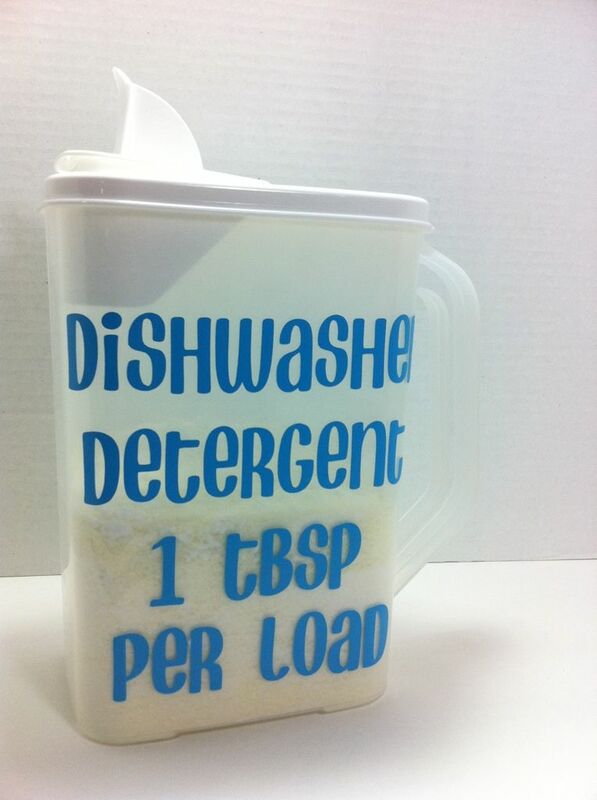 I think I would like to try making the detergent, thanks for the link. What a great idea! I need to do this too, so my boys can stop making excuses for not doing laundry! Thanks so much for sharing both the idea, the recipe and the website. With two girls in college and a son headed there in a year I am scrambling for ideas to save money. Thanks, Joy for sharing your ideas and the recipe website. It will certainly be used! Thanks again. That is really a clever idea! I'm heading over to the other blog - I have to see this recipe. TFS! oooh, you got my creative juices flowing! Great idea! What a great idea and even my husband could not say he would not know how to do the dishes with the directions in big bold print and saving money by making your own besides. He should be thrilled. Thanks for sharing. Great storage idea - I would love to do that for the cereal! That is just perfect! Love your gallery! Thanks! love the idea, it is great. Thank you so much for sharing my post! I am glad that you liked it. Btw I love my homemade laundry soap too, the recipe is on my blog. It's mostly made out of the same ingredients as the dishwasher detergent. Super easy and works well. Now back to the praising, I really appreciate you posting this you are AWESOME. I just love saving money anyway I can, why not make your own soap! What a great idea! I love it!! I used the vinyl cut outs to label doors and walk ways for a party, but never thought about it for this kind of stuff! This seems really neat! I love playing with vinyl!! Love it! I may have to try this out. Coolio & the Gang! This is Awesome! May have to give it a try, we used those little pillows as well & do loads of dishes! Thanks for sharing!!! Love this idea! Now if only I had a dishwasher that I could use it on. I have to feed my dishwasher food otherwise she complains bitterly lol.